The most romantic day of the year is this Thursday and nothing says “I Love You” more than a solo self-care night! If that’s not your cup of tea, why not spend the evening with your best gal pals watching rom coms in your pj’s? Or if you want to spend it with a special someone, make the day memorable by taking a trip down memory lane. No matter how you choose to celebrate, be sure to let someone know how you feel, even if it is yourself! Valentines Day for the lifetime couple who have been together from childhood to grandchildren: a day full of her favorite flowers, his old love letters, the mirror she uses to get ready for their special date night. It’s his tradition to make dinner for her on this day— her favorite meals paired with the wine they drank at their wedding. Through the evening, records spin in the background, crackling the sounds of Frank Sinatra and Dean Martin. Their song is “The Way You Look Tonight”— whenever that one comes on, he grabs her hand, leading them to dance the night away. She still gets butterflies from him, 70 years later. 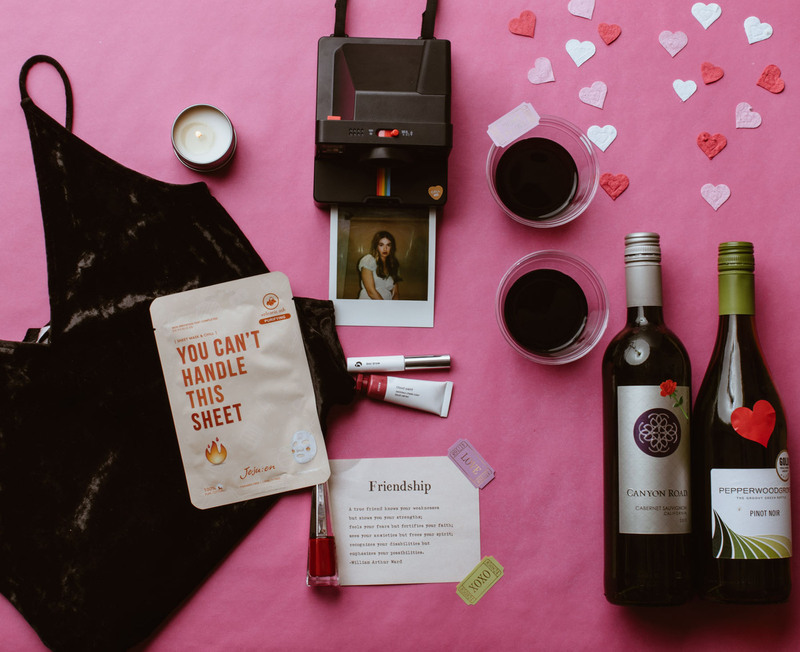 Valentines with your go-to gals! An all day and all night venture. The girls start their day with brunch— obviously paired with Instagram pictures of their meals. They move to shopping and picking outfits out for each other to wear that night. When the evening comes, galentines get ready together— sharing makeup, face-masks and each other’s clothes. And, of course, plenty of wine & polaroid selfies. They’ll take a night on the town, wearing their favorite lipsticks, heeled booties and hoops: the ultimate clique. Valentines Day is meant for self-appreciation, because who doesn’t love a good self-cuddle watching all the romance movies available. Light a few candles, have a bag of chocolates by your side, while wearing a face mask—seriously, what’s better? February 14 is all about you and your love for yourself. Take some cute pics and post them on social media. Show yourself off! You don’t need a partner to be happy— you’re your own best friend. Treat yourself, you deserve it.